UtiliChoice International was established in 1998 at the outset of electric choice. Since then, we’ve grown from procuring energy for our first location to thousands of locations we now handle across America. From our first year, we have assisted both single-site locations and national chains and over the years have grown tremendously. 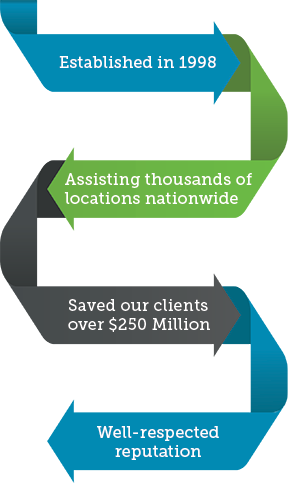 We’ve helped to save our clients over $250 Million to date and we continually work to satisfy our customers with our personal approach to service. UtiliChoice has earned a well-respected reputation among both clients and suppliers. Since 1998, we have proven ourselves to be reliable, equitable, competitive, and attentive to the needs and preferences of each business we assist. We embrace each client’s unique requirements and we genuinely do our part to customize both the experience and contract terms with the supplier chosen. We’re one of the few consultants with intimate knowledge of the deregulated territories nationwide. Become part of our history and we are confident you’ll agree! Call us today at 1.800.530.1999 to start the conversation. Let's move forward together.